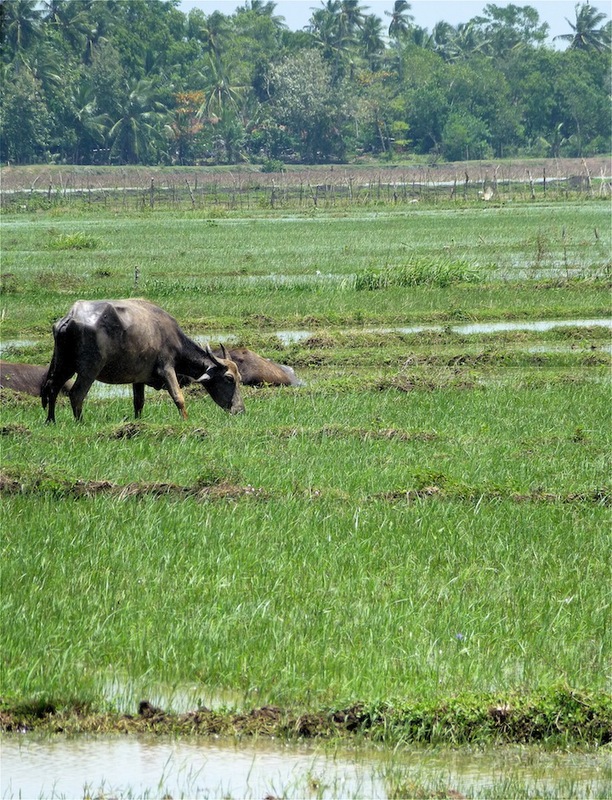 Sri Lankan Sojourns: Buffalo Curds and Treacle. One of the (many) highlights of Brunyfire’s recent Sri Lankan sojourn was being on the receiving end of the hospitality of locals. This was never more apparent than when we sought out the makers of the traditional Sri Lankan sweet treat, mee-kiri or buffalo curd. 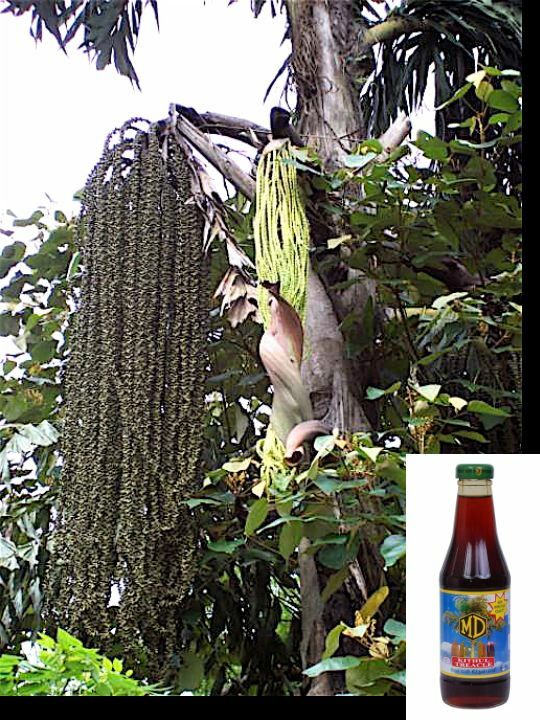 We were aware of mee-kiri; had seen it featured on SBS before we left Tassie; had read about it and had previously eaten it with the traditional kittul palm treacle before we arrived in Tissamaharama, in Sri Lanka’s south, which is known for its curd making. 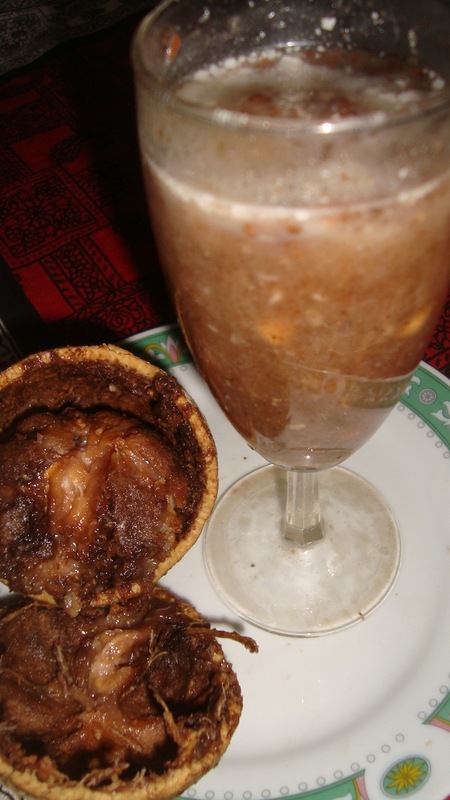 Curd and treacle is one of Sri Lanks’s most popular and well known desserts – sold by street vendors for a few cents a pot or featuring in pride of place at a wedding buffet, a religious feast or a festival. So we find ourselves down a narrow road outside of town, lined with modest but immaculately kept homes……… ………and turn into the yard of a local family, dedicated to the daily production of buffalo curds. This family greeted us with polite surprise! We were the first visitors they had ever had who were interested in seeing how mee-kiri was made, and they treated us like royalty! Despite the presence of our driver, we communicated naturally with wild hand gestures and broad smiles. 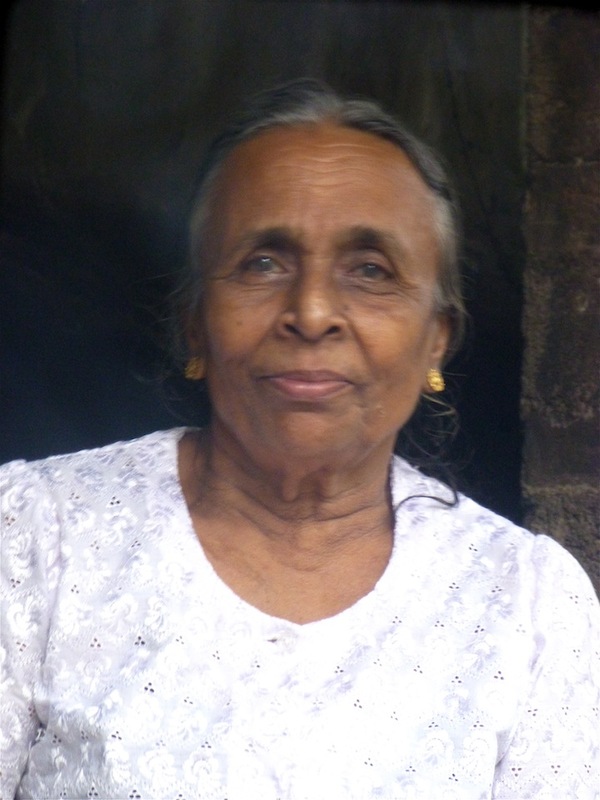 We were utterly charmed by their generosity which started with the matriarch of the family…….. ………organising chairs for us to view procedures in comfort! 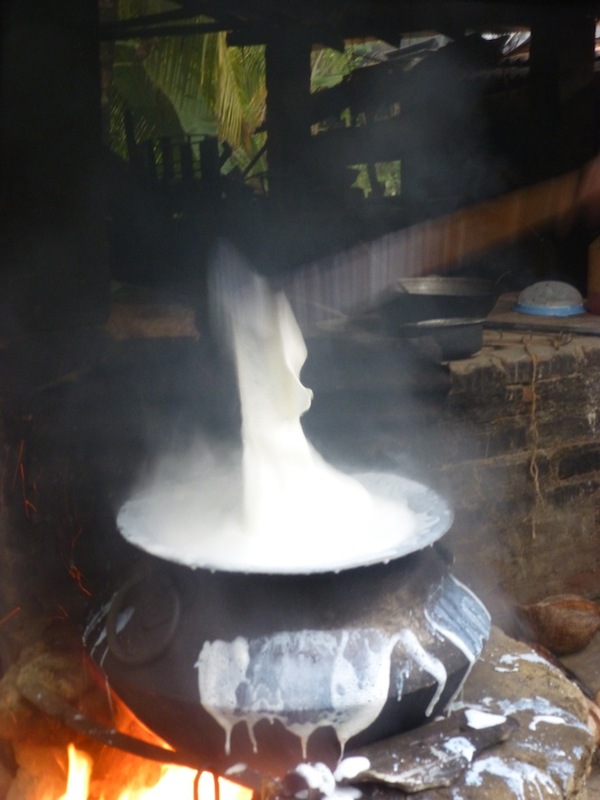 Mee-kiri is made from buffalo milk…….. ……..which is brought in from village farms in large metal containers to the curd maker’s home where it is poured into wide mouthed aluminium caldrons. 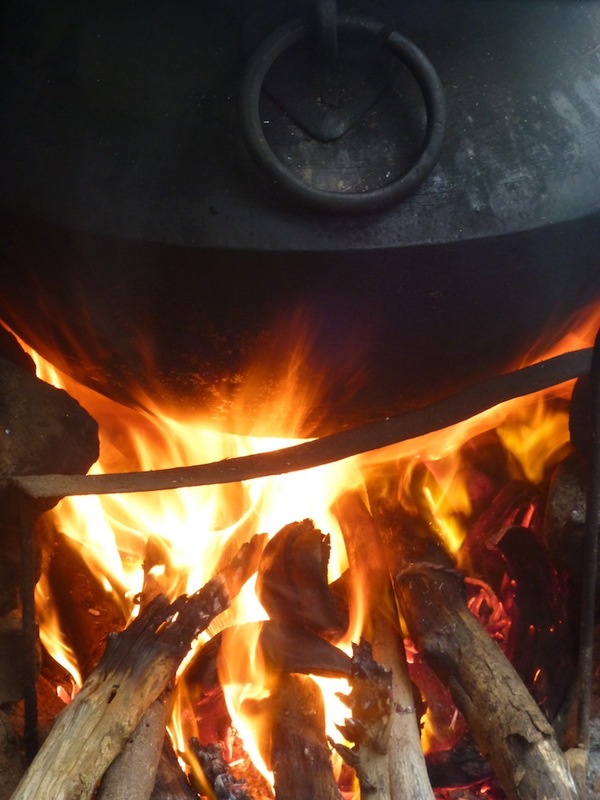 The caldron is placed on an adobe fireplace and is cooked over an intense heat whilst someone stirs the milk……… ………which is often a family affair! 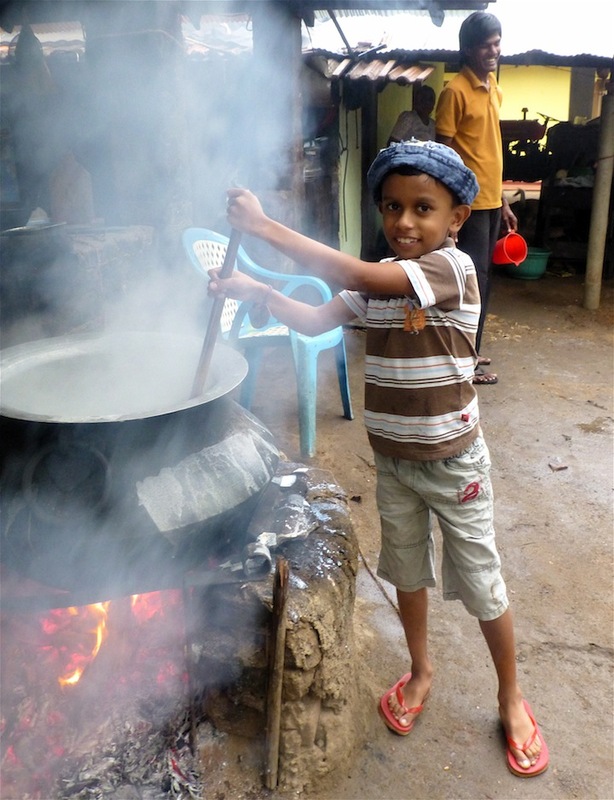 This little guy is our hostess’s grandson……….. ……….stirring is maintained at all times to prevent the milk from boiling over, burning or sticking. 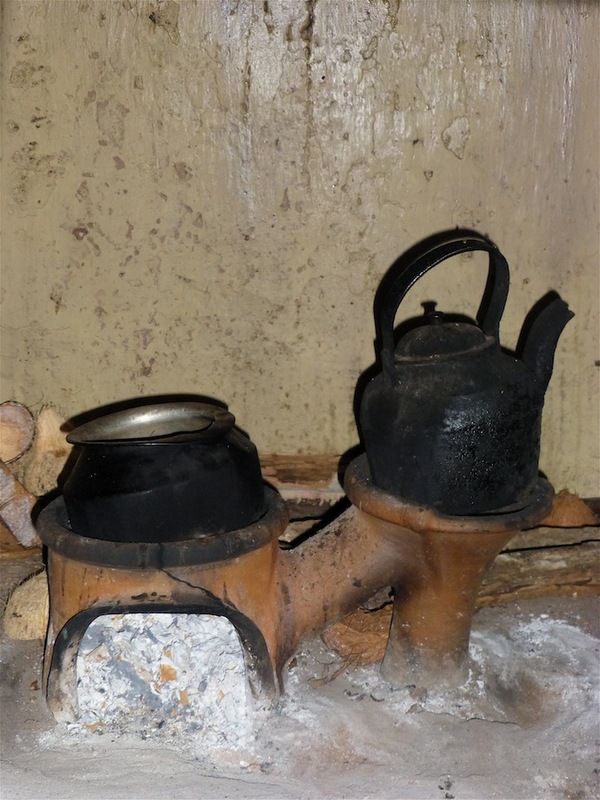 The fire’s intensity is fierce……… ….. and at one stage, wood is hauled out in an attempt to drop the temperature and prevent the milk from boiling over. Our lovely hostess offered us a couple of glasses of hot buffalo milk to try in tall glasses – the verdict – delicious. Buffalo milk is a fabulous product for less well off consumers as it contains higher total solids than cow milk, which makes it thicker and creamier because of it containing 100% more fat content than cow’s milk. The high peroxidase activity within buffalo milk enables it to be preserved naturally for a long period. 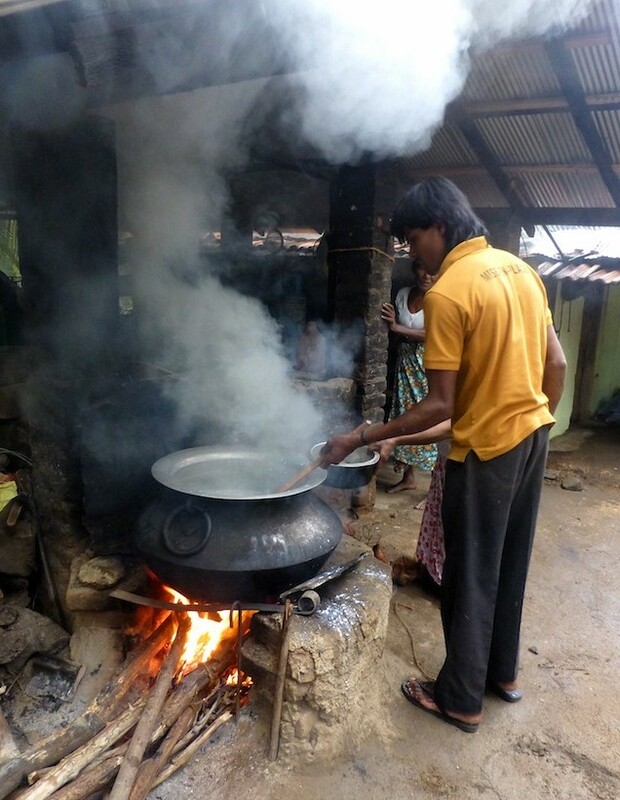 This latter is important for many rural families without refrigeration in their homes. The only down side being that a good cow gives around 15 to 20 liters of milk, whereas a good buffalo gives anywhere between 7 to 11 liters milk per day. 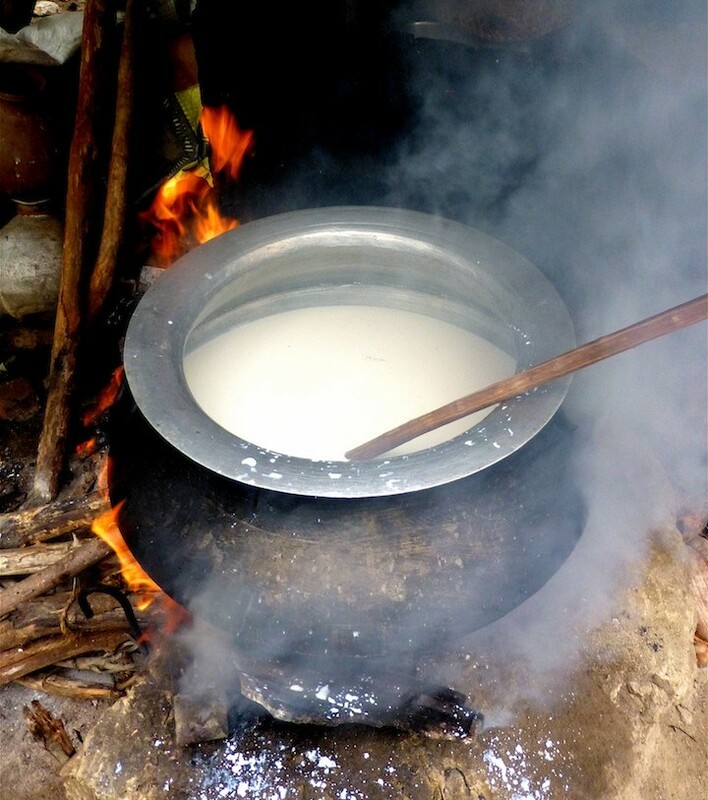 Once the milk has doubled in volume it is removed with speed from the fire……… …….and taken to the awaiting clay pots or kiri hatti in a side building. The hot milk is poured straight away into the awaiting kirri hatti – the place was like a sauna and Brunyfire’s camera lens and specs were fogged up entirely, much to the amusement of the family. 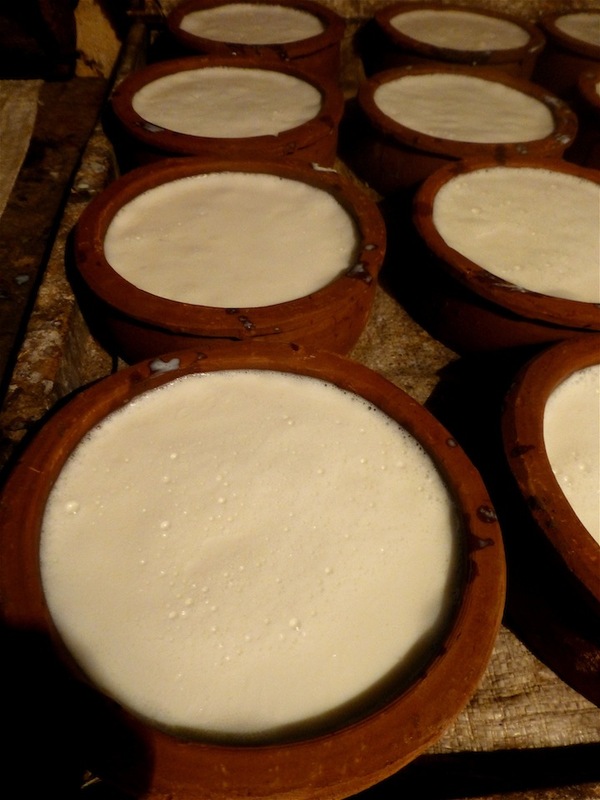 Once the milk has cooled down to room temperature, a few spoonfuls of the previous days curd culture is mixed into the fresh milk to inoculate the new batch and start fermentation – which usually takes about six hours. The importance of the kiri hatti (curd pots) is in their crudity! 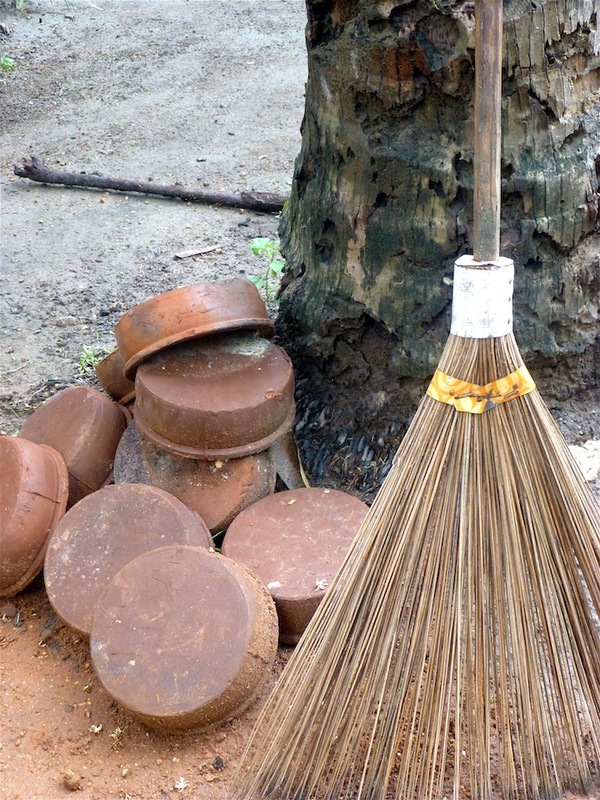 Coarse, open textured red clay is used for making these by the local potters, who then fire their ware to a bit over 800 degrees centigrade. This results in a fairly porous body, and like all their cooking pots of similar firing temperature, means that the thermal properties of these pots enable slow and gentle heating and cooling. 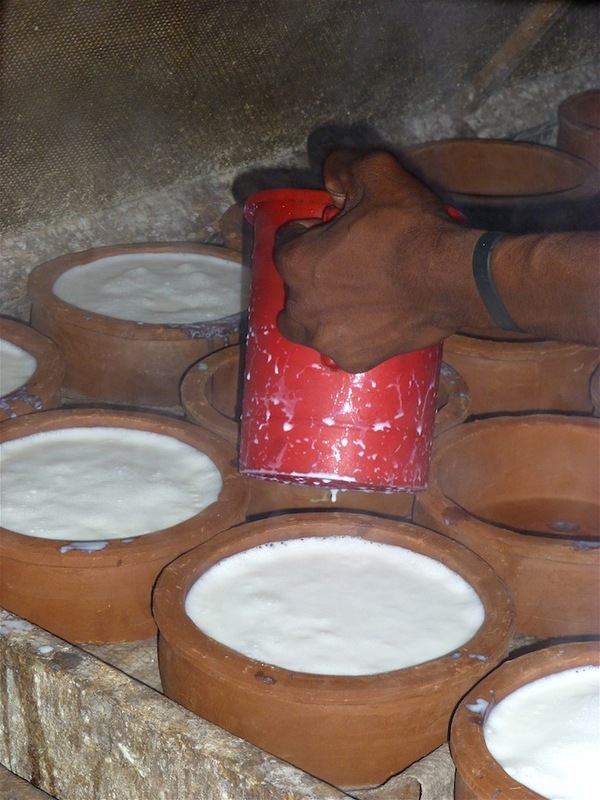 Thus the kiri hatti have great insulating properties, and along with the steamy heat of the curd room, this is all that is needed to maintain an even temperature to enable the curd to mature properly. 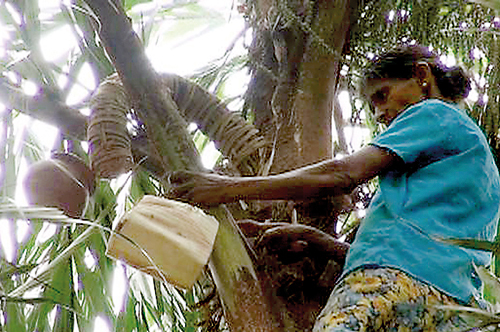 Both men and women participate in kitul tapping which consists of climbing the palm tree on crude bamboo ladders lashed to the tree’s trunk whilst hauling up a clay pot and a ferocious looking machete. The clay pot is attached underneath the cut flower head and the sap allowed to drip for several hours before collection. 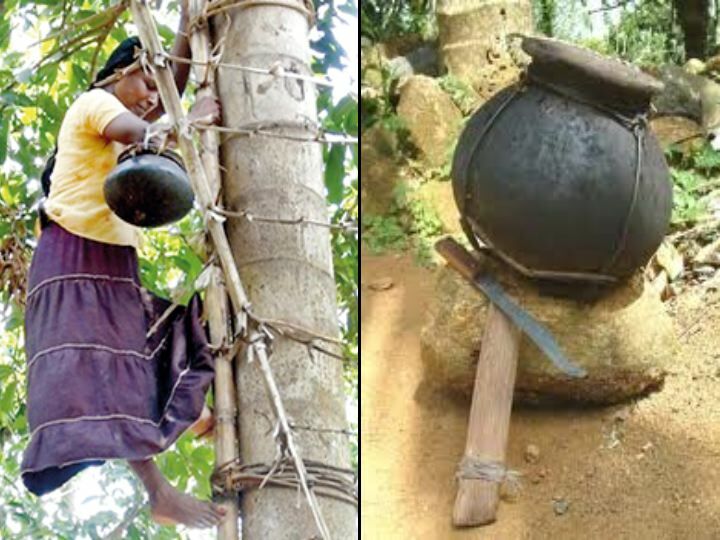 In the main, men tap the inflorescence and collect the sap, while women boil the treacle and produce the jaggery. During the time we watched the curds being produced, we continued to maintain a dialogue of sorts with our hosts and when our hostess realised Brunyfire’s interest in cooking, cooking pots and local produce, she was keen to show off her kitchen…….. ……… and some of her garden’s produce, in particular, her wood apple tree. 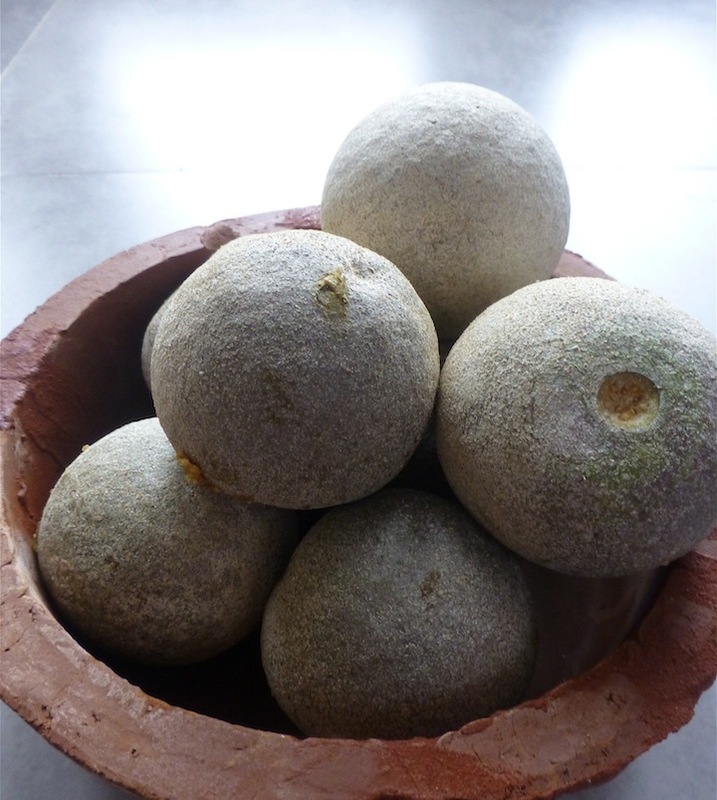 Wood apples (Limonia acidissima) are a weird fruit, favoured by elephants apparently who consider them a special treat! With a tough, wood like outer shell and a soft pulpy interior, the fruit is eaten straight or blended into an assortment of drinks, sweets, or jams. 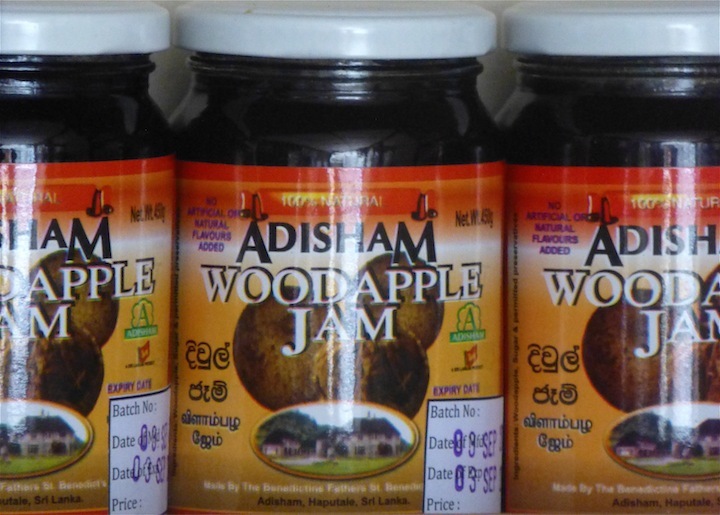 (Brunyfire spotted these woodapple jams at the Adisham monastery). The scooped-out pulp from the wood apple fruit is eaten uncooked with or without sugar, or is combined with coconut milk and palm-sugar syrup and drunk as a beverage as we sampled it on our first morning in Negombo. A taste that you either take to immediately, or not – Brunyfire enjoyed it whilst partner didn’t – takes all types. 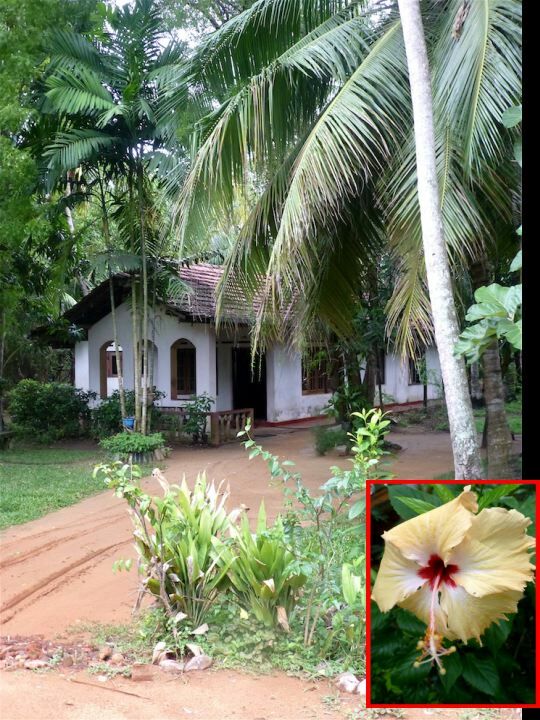 (The above image comes, with thanks, from A Taste of Sri Lankan cuisine). Our hostess presented us with a bagful of wood apples and also an unusual sticky pudding like substance, wrapped up in newspaper that Brunyfire didn’t recognise at first. It wasn’t until it was unwrapped back at the hotel that I discovered it was in fact kalu dodol – a jelly-like pudding much sought after, particularly by those who make the pilgramage to Kataragama (near Tissamaharama). 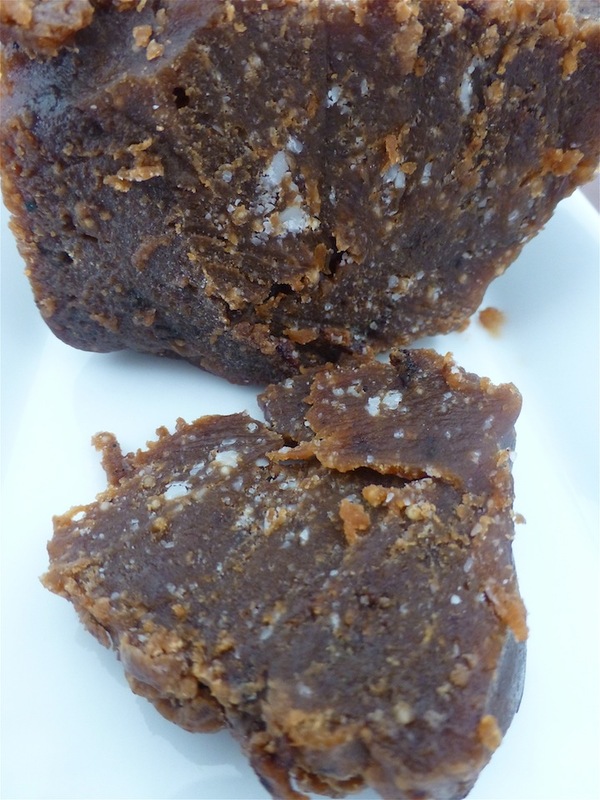 Kalu dodol is a sweet dish of Portuguese origin – it’s dark and sticky consisting mainly of kitul jaggery, rice flour, coconut milk and, in this version, cashew nuts. Kalu dodol is a very difficult and time-consuming dish to prepare and so the presentation to us by our hostess of this gift was priceless indeed.